Construction began on Oct. 31, 1981, when Secretary of Defense Casper Weinberger authenticated the keel laying of TR by initiating the first weld. Capt. Paul W. Parcells was named Prospective Commanding Officer in Feb. 1984, and, that October, the ship was officially christened. On Oct. 25, 1986, TR was placed in active service. Capt. Dayton W. Ritt became TR's second Commanding Officer on Oct. 3, 1987, and on Dec. 30, 1988, TR started her maiden deployment, which was also the maiden deployment of the first 10-squadron air wing, Carrier Air Wing Eight. USS Theodore Roosevelt was awarded the Battle "E" from Commander, Naval Air Force, U.S. Atlantic Fleet, on Mar. 20, 1990. On Jun. 9, 1990, Capt. Charles S. Abbot became the ship's third Commanding Officer and on Dec. 28, TR and CVW-8 deployed for Operation Desert Shield. TR entered the war on Jan. 9, 1991, eventually flying over 4,200 sorties (more than any other carrier) and dropping more than 4,800,000 pounds of ordnance before the cease-fire on Feb. 28. When Iraqi forces turned on the Kurds, TR and CVW-8 were among the first coalition forces in Operation Provide Comfort, flying patrols over northern Iraq. After a 189-day deployment, with 169 days at sea, TR returned to Norfolk on Jun. 28, 1991. On Feb. 14, 1992, the ship won its second Battle "E." This was followed by the award of the Battenburg Cup for 1991 as the Atlantic Fleet's premier ship. Capt. Stanley W. Bryant became TR's fourth Commanding Officer on Aug. 27, 1992. TR and CVW-8 began their third deployment on Mar. 11, 1993, teamed with the Special Purpose Marine Air Ground Task Force (SPMAGTF) to test the concept of embarking a multi-purpose Marine force in a carrier. TR hosted President Bill Clinton's first visit to a U. S. Navy ship, then sailed to the Adriatic as CVW-8 planes enforced Operation Deny Flight in the U. S. no-fly zone over Bosnia. In June, on the way to only her second port visit, TR was ordered to turn around and transit the Suez Canal en-route to the Red Sea to participate in Operation Southern Watch, enforcing the no-fly zone over Iraq. Deployed for 184 days, TR spent 169 days underway. Her flight deck logged over 16,000 hours, and CVW-8 flew more sorties than during the Persian Gulf War. For its accomplishments, the ship received its second Meritorious Unit Commendation. In Nov. 1993, TR entered Norfolk Naval Shipyard (NNSY) for a Selected Restricted Availability (SRA). Heading back to sea on Apr. 14, 1994, TR became the first nuclear carrier to complete an SRA ahead of schedule at NNSY. Awards for 1993 continued. TR received the CINCLANTFLT Golden Anchor Award for the best retention in an Atlantic Fleet carrier. On Mar. 10, 1994, TR received its third Battle "E." Then on June 3, TR was awarded its second Battenburg Cup as the best ship in the Atlantic Fleet. On Jul. 8, 1994, Capt. Ronald L. Christenson became TR's fifth Commanding Officer. TR and CVW-8 began their fourth deployment on Mar. 1995, operating in the Red Sea in support of Operation Southern Watch. TR also provided a "Forward... from the Sea" presence, conducting flight operations in support of Operations Deny Flight and Sharp Guard over the skies of Bosnia and in the Adriatic operating areas. Deny Flight evolved into Operation Deliberate Force, as CVW-8 aircraft led NATO strikes against strategic Bosnian Serb targets in Sarajevo-Herzegovina. During TR's transit home, Secretary of the Navy John Dalton came aboard and awarded the Theodore Roosevelt Battle Group the Navy Unit Commendation for its Bosnia operations. In 1996, TR received its third consecutive Golden Anchor Award and Commander, Naval Air Force, U.S. Atlantic Fleet's first Security Excellence Award. CVW-3 joined TR in May 1996 prior to her port visit to Halifax, Nova Scotia. On Nov. 1, 1996, Capt. David Architzel became TR's sixth Commanding Officer. TR deployed for her fifth deployment on Nov. 25, 1996, conducting operations in the Mediterranean and Arabian Gulf in support of Operation Southern Watch. On Jul. 8, 1997, TR entered the Newport News Shipbuilding yard for a one-year Extended Drydock and Selected Restricted Availability (EDSRA), her first major overhaul since commissioning. In Feb. 1998, TR received her fifth Golden Anchor Award while in the shipyard. One year later, TR returned to her homeport at the Norfolk Naval Station. Capt. David R. Bryant became TR's seventh Commanding Officer on Sep. 22, 1998. TR began her sixth deployment on Mar. 26, 1999 with CVW-8. They were immediately called to duty in the Ionian Sea to support NATO's Operation Allied Force. TR and CVW-8 aircraft conducted air strikes for two months over the skies of Kosovo against the Serbians. TR and CVW-8 were then dispatched to support Operation Southern Watch, enforcing the "no-fly" zone over Southern Iraq. TR returned to her homeport of Norfolk, Va., on Sept 24, 1999. On January 7, 2000, TR entered a Planned Incremental Availability at the Norfolk Naval Naval Shipyard, Portsmouth, Virginia. This six month maintenance period ended on June 30, 2000 when the ship departed on sea trials. TR successfully completed her Inter-Deployment Training Cycle in August 2001. TR began her seventh deployment on September 19, 2001 with Carrier Air Wing One. After a routine transit of the Atlantic Ocean, TR and CVW-1 were called to support Operation Enduring Freedom. Receiving support from around the country, TR and CVW-1 led coalition forces in creating a more stable government in Afgahnistan and hunting down members of al-Qaeda. After breaking the record longest period underway since WWII, TR's crew only hit two ports after 159 days at sea. TR was again awarded the Battenberg Cup, Naval Unit Commendation, and Battle E. TR pulled back in March 17, 2001. On 19 February 2004 TR made its way up the Elizabeth River to start a Docked Planned Incremental Availability (DPIA) at Norfolk Naval Shipyard (NNSY) in Portsmouth, VA. TR entered its slot at Dry Dock 8 and the aft dock wall closed behind it. As the river slowly began draining the massive concrete void, Sailors observing must have wondered exactly how such a seemingly insurmountable task would be possible to complete. Several extensive evolutions awaited the several thousand people making up TR project team, consisting of its own Sailors, shipyard workers and contractors. The mission of transforming an 18-year-old, 1,092-foot long, 97,000-ton aircraft carrier into what is now essentially a brand new ship was no small one. She entered the shipyard with the most extensive work package ever attempted within the allotted time period. The purpose of the DPIA was to ensure TR maintained its material condition as well as kept up with technological advances to maximize mission capability. USS Theodore Roosevelt conducted a "fast cruise" Dec. 6-10, 2004 that marked the end of the ship's Docked Planned Incremental Availability (DPIA) at Norfolk Naval Shipyard (NNSY) in Portsmouth, VA. Although sea trials do not officially begin until TR leaves NNSY and gets under way, the fast cruise was meant to showcase more of a change from one evolution to the other. It also showed that TR was ready for tasking. The ship was next expected to make its return home to Naval Station Norfolk upon completion of sea trials, before the ship’s first holiday leave period. USS Theodore Roosevelt (TR) (CVN 71) met its goal of completing its Docked Planned Incremental Availability (DPIA) at Norfolk Naval Shipyard (NNSY) in Portmouth, Va., and sea trials, as well as delivering the ship back to the fleet 17 December 2004. During the ship's DPIA, everything from converters for hot water heaters and improved head facilities, to upgrades for the elevators and major work on two of the four catapults, was overhauled or replaced. A major project while in dry dock was the removing, repairing and reinstalling of the ship’s propellers (or screws). Two of the four were replaced altogether. By mid-January 2005 USS Theodore Roosevelt (CVN 71) and Carrier Air Wing Eight (CVW-8) are underway again, and the flight deck was back in business. TR conducted carrier flight deck certifications, which took a tremendous amount of manpower to make this evolution happen. Certifications become a necessity for aircraft carriers coming out of dry-docking planned incremental availability (DPIA). Every job performed by personnel from the hangar bay and flight deck to those in Supply and Medical is observed and evaluated. By April 2005 the nuclear powered aircraft carrier, and Carrier Air Wing Eight (CAG-8) were underway for Tailored Ship Training Availability and Final Evaluation Problem (TSTA/FEP) in the Atlantic Ocean. A ceremony held aboard USS Theodore Roosevelt (CVN 71) (TR) 04 May 2005 recognized the ongoing friendship between Spain and the United States with the joining of a Spanish ship to the TR Carrier Strike Group. Alvaro de Bazan (F 101), a medium-size Spanish frigate, officially became a part of Carrier Strike Group 2. 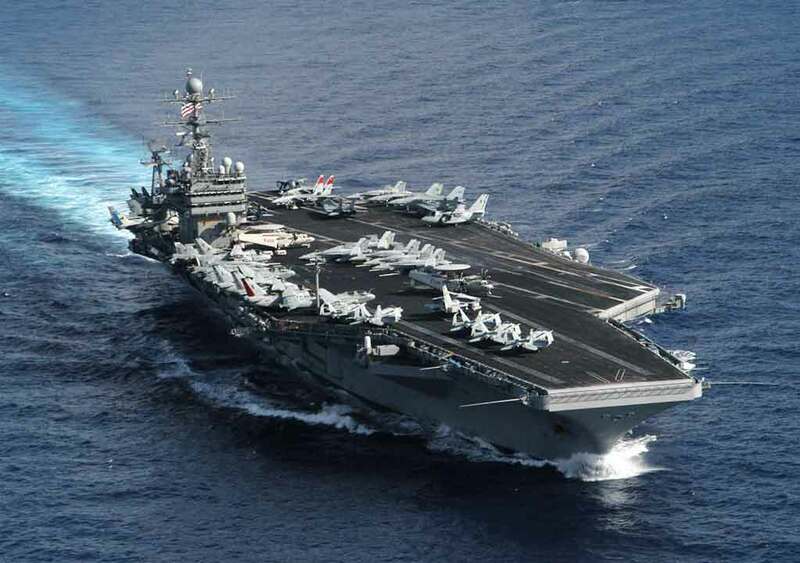 By 19 May 2005 USS Theodore Roosevelt (CVN 71) was underway off the coast of Virginia, conducting carrier qualifications in the Atlantic Ocean.